Pinterest is suddenly everyone’s best friend or worst enemy. Have you noticed? Every day I see posts that say, “Well, there went my day, I couldn’t find my way off of Pinterest.” The very next post will say, “50 ways to market your business on Pinterest”, which of course is followed by “Pinterest is the devil and will make you go to hell.” Ok, I’m just paraphrasing that last one. First… Breathe! Let’s take a really good look at what’s going on here. Pinterest came along and no one expected it. It’s kind of like we didn’t see Twitter coming (and many of us still don’t quite get how it’s still there). It went from new to global in 2.2 seconds. It might be the next Facebook, or the next MySpace (wait, maybe that’s still around? I’m not quite sure.) What we do know is that right now it’s really BIG. In a few weeks, months or years it might be GINORMOUS or it might be DEAD. Right now, it’s really hard to say. The first thing we need to do is pay attention, act rationally and figure out how to adapt. Either way, it’s all going to be OK. First let’s identify what Pinterest is. 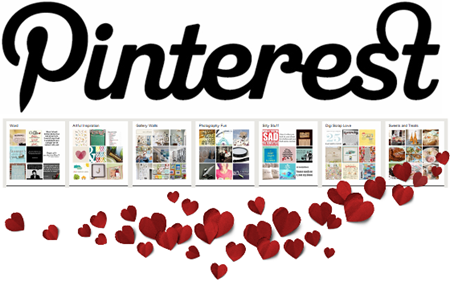 According to it’s website, Pinterest is a “Virtual Pinboard”. That’s it. It’s a glorified bulletin board. It exists for us to put pretty things on. We can organize the pretty things into smaller boards. And finally, we can share our pins or boards with our friends (and the other kajillion people who will see them through their main feeds). You need to have someone invite you to join Pinterest, which seems to do a great job of keeping spammers off the site. (If you wait for an invitation to be sent to you, you’ll grow old and die of boredom. Just ask one of your friends on facebook. Someone will do it, I promise.) When setting up your account, which you can conveniently do by linking it with all your facebook or twitter info – you know, so you can share what you pin there, you’ll have to agree to their terms of service. Well, first let me tell you that I happen to own another website that has a lot of images put on it by other people. You probably are a member to a few others as well – think of ANY blogging community, or social site that you download photos to. These sites require language like this in order to have photos posted, or to market the site where those photos may be seen. Yes, they may even need to be altered, adapted or modified (as in size or shape) – logos and watermarks might even need to be removed to make any advertisements look fluid and pleasing to the eye. It seems highly unlikely that they really want to do anything with your photos. I’m not implying you don’t have great ones, just please… that’s not the intent. With that said, I will say that apparently Martha Stewart did have a little revolt on her hands when she produced a book based on projects on her bulletin boards and the authors of the projects were not properly credited or paid. That almost never happens though. I actually only know about this because we received a lot of emails from crafters who were worried about this on my other crafty blogging community website. "you represent and warrant that: (i) you either are the sole and exclusive owner of all Member Content that you make available through the Site, Application and Services or you have all rights, licenses, consents and releases that are necessary to grant to Cold Brew Labs the rights in such Member Content, as contemplated under these Terms." So, on one hand you should only share stuff you own but on the other, you shouldn’t just self promote. Yeah, that’s slicing the law pretty close, isn’t it? In a tweetchat about Protecting Your Content that I was hosting earlier today, one of our participants, who happened to be a copyright attorney stated that the real problem with Pinterest is that the photos pinned are full size and housed on Pinterest’s website. Google, for instance, only uses thumbnails. To view a larger image, you are sent back to the originating source. Pinterest doesn’t do that. Instead, they not only take the full size image, they store it on their servers with a new URL. ummm… that might be a problem. Still, it’s likely to be their problem & chances are, repinning someone else’s pin isn’t likely to make you culpable. So, now we know that Pinterest is a visual feast, a virtual pinboard that you can share with everyone, but pinning anything except your own images is probably breaking a variety of copyright laws. What would the fun of that be? I think I have folders on my hard drive that I can do that on, a cloud if I need it to be mobile. Many of us have been working hard for years trying to figure out how to get people to see us. Ta-da, whoot there it is…. (can you hear the music playing?) So now we are down to brass taxes. 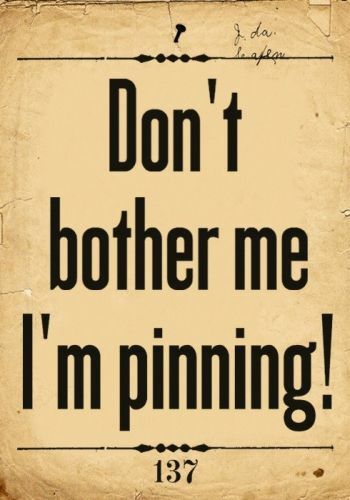 To pin or not to pin. If people are going to pin our stuff, then how do we keep from worrying about them stealing our copyrights? Well, that’s not this blog. 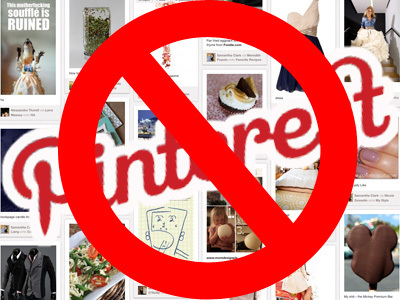 Should you close your Pinterest account to keep from having your business sued? Really? That’s not gonna happen. Is it OK for you to spend 4 hours a night pinning fluffy bunnies and garden party recipes? Have you ever even had a garden party? Should you be pinning that really gorgeous photo of the HGTV Dream Home? Do you think they’ll mind the advertising and SEO link backs? But what about the photo of the neighbors hydrangea bush that looks so perfectly pink and blue? Ask first, especially if the photo is somewhere that not just anyone could find. Remember, anytime you post something on your website, blog or social media page, it doesn’t mean it’s fair game. You still have copyright privileges and so does every other person on the planet – or at least here in the US and Canada. Don’t panic, but do use proper netiquette. Whenever there is a question, ask first. « BRAND Your Images Before Someone Pins It!